Many children with cancer are diagnosed during infancy and toddlerhood (< 3 years of age), potentially resulting in disrupted and/or missed developmental opportunities. Our objective was to describe the functioning of infants and toddlers with cancer who were clinically referred for evaluation at a hospital-based psychology clinic. Data from 29 very young children with cancer (Mage = 23.62 ± 6.6 months; 55.2% male) who completed clinically referred assessments from 2010 to 2015 were abstracted. Children were 11.3 months post-diagnosis (SD = 7.77, range 1–29 months) with just over half off-therapy at the time of assessment (55.2%). Overall, developmental functioning was significantly below expectations [t(22) = − 8.99, p < .001]. Adaptive functioning [t(25) = − 6.41, p < .001] was also significantly below expectations. Infants and toddlers with cancer appear to be at significant risk for weaknesses in early cognitive and adaptive functioning. The margin of deficits found in this study warrant the need for further investigation and consideration of this young population to ensure optimal functional development. Authors Ansley E. Kenney, Jennifer L. Harman, Andrew E. Molnar, Jr., Niki Jurbergs, and Victoria W. Willard declare that they have no conflict of interest. All procedures performed in studies involving human participants were in accordance with the ethical standards of the institutional and/or national research committee (St Jude Children’s Research Hospital) and with the 1964 Helsinki declaration and its later amendments or comparable ethical standards. Bornstein, M. H., Scrimin, S., Putnick, D. L., Capello, F., Haynes, O., Falco, S., … Pillon, M. (2012). Neurodevelopmental functioning in very young children undergoing treatment for non-CNS cancer. 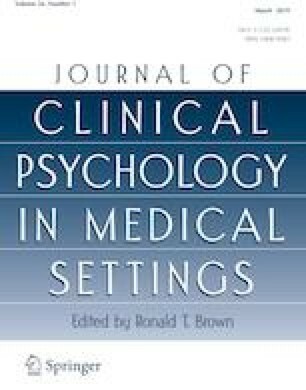 Journal of Pediatric Psychology, 37, 660–673. https://doi.org/10.1093/jpepsy/jss003. Caspi, A., Houts, R. M., Belsky, D. W., Harrington, H., Hogan, S., Ramrakha, S., …, Moffit, T. E. (2016). Childhood forecasting of a small segment of the population with large economic burden. Nature Human Behaviour, 1, 0005. https://doi.org/10.1038/s41562-016-0005. Dhall, G., Grodman, H., Ji, L., Sands, S., Gardner, S., Dunkel, I. J., …, Finlay, J. L. (2008). Outcome of children less than three years old at diagnosis with non-metastatic medulloblastoma treated with chemotherapy on the “Head Start” I and II protocols. Pediatric Blood & Cancer, 50, 1169–1175. https://doi.org/10.1002/pbc.21525. Mulhern, R. K., Palmer, S. L., Reddick, W. E., Glass, J. O., Kun, L. E., Taylor, J., …, Gajjar, A. (2001). Risks of young age for selected neurocognitive deficits in medulloblastoma are associated with white matter loss. Journal of Clinical Oncology, 19, 472–479. https://doi.org/10.1200/JCO.2001.19.2.472. Willard, V. W., Qaddoumi, I., Chen, S., Zhang, H., Brennan, R., Rodriguez-Galindo, C., …, Phipps, S. (2014). Developmental and adaptive functioning in children with retinoblastoma: A longitudinal investigation. Journal of Clinical Oncology, 32, 2788–2793. https://doi.org/10.1200/JCO.2013.53.1996.